Clowns, zombies, ghouls — the things that bump in the night. As children, fear could run amok with any imagination as the nights went on. This is even more fascinating as the feeling returns as an adult with Andrès Muschietti’s adaptation of the 1,100-page Stephen King opus of the same name that captures and elaborates on the intricacies of children’s fear and the unmistakable anticipation of dread. Transporting the setting 30 years into the future from the 1950s to the rad 80s, we follow seven children of Derry, Maine, as they are thrust against fear itself as the violent Pennywise the Dancing Clown once again begins to trap its young victims. 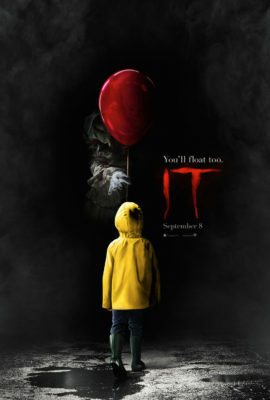 Previously adapted into a two-part ABC series from the early 90s this updated version brings on a bevy of extremely talented young actors and pits them against a freakishly devious performance from Bill Skarsgard as the deranged Pennywise. Following skepticism from its initial announcement, this film worked extremely well in disarming any sense of worry I could have encountered. More violent and wickedly creepy than expected it only took only the first scene of the young Georgie Denbrough chasing his paper boat down the flooding street to display the malevolent nature the film achieves. The brilliance of this project is in handling the deft tone of a mad house horror with a striking tale of youth coming to grips with their impending adulthood. A bevy of incredible performances across the board from the likes of Jaeden Lieberher and Sophia Lillis, as Bill Denbrough and Bev Marsh respectively, that grounds the film in a believability and accessibility that allows for moments of tenderness and growth unseen in previous adaptations. Muschietti creates a fully realized world around these characters, for when Pennywise does show his smug (read terrifying) mug the audience cannot help but understand the absolute pants ruining fear the children are experiencing. Several extremely well crafted set-pieces build the scares in genuinely surprising ways from the aforementioned dreary opening to a scene with a slide projector that transforms in an unbearably tense moment that will surely stick with any viewer. The only components that do keep the film from attaining an absolute excellence are a film score that does play it too safe in its on-the-nose compositions and an over reliance on a particular type of jump scare that, while effective, does feel undeserved in the early half of the film. Yet, these do nothing to take away from those brilliant moments and the nightmares that will undoubtedly arise from the new interpretation of the Demon clown.